Welcome To Video Marketing 101! If you know you need to be using video in your business, but somehow you have never got around to taking that first step or perhaps you dislike being on camera or tech gives you the collywobbles, then you are in the right place! Video Marketing 101 is designed to banish your hesitations about being on camera or the tech of video, where we take you, step by simple step, along the video path, giving you the confidence to create videos, simply and easily, using your smartphone and/or laptop, with free software. Video Marketing 101 is a 3 month, 6 module course, meeting every two weeks, using the program Zoom. The Sessions are 90 minutes long - the first 30 - 45 minutes cover new content and the session is then opened up for Q&A. reviews the power of video to extend your reach, influence and visibility, so you can reach many more people, who need you and your message. These people are already looking for you online, but the chances are they can't find you in a way that has them come to know, like and trust you, which is video's strength. shows you the simple, non-technical ways, to create video today. No longer needing expensive equipment and using free software, you can begin creating video immediately. We all know practice makes perfect, but often making that first video takes courage and in truth, your first video won't be your best. You will learn how to practice incognito, until you are happy with your video and are ready to publish your wise words. 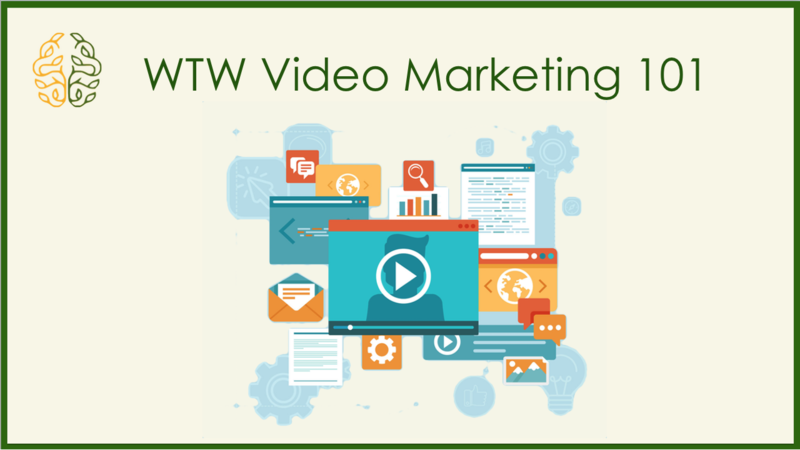 You may be stuck at the "What of Video" - what do I say? How do I construct a creative message? This module show you "What To Say and How To Say It"
You've made your video. You're comfortable with your message and presentation, so where are you going to broadcast your video? Keeping all simple, this module focuses on the two behemoths of video, Facebook and YouTube. Looking over my shoulder, on the computer screen, I show you "click by click" how to edit and upload video to Facebook and YouTube. This Module deals with those common questions of When and How Often do I post my videos for maximum effect. There's magic, mystery and method in when and how to post. This module gives you guidelines for posting and shows you how to repurpose your videos many times over. In Module 6, together we create your Video Marketing Plan. You will leave the course with a simple, rinse and repeat plan, to use on a weekly basis to grow your visibility, so you can be found by those, who are already looking for you and have them come to know, like and trust you. You have completed the course but you will continue to have access to the Private Facebook Groups with replays of the sessions, and where you can continue asking any questions or challenges which may crop up. One of the biggest challenges running any program is ensuring assigned tasks are completed. Everyone intends to complete their "homework" but we are all busy and once away from a live session, our daily lives take over and finding time to complete tasks is not easy. If you know you would benefit from an accountability partner or group and a system to keep you on task, for an additional investment, Video Marketing 101 has partnered with a program making easier for you to complete your tasks and make consistent progress. I am and will continue to be enrolled in this program, as I am impressed how effectively it keeps me on track, moving me forward fast. I am a pretty organized person, yet setting my daily goals in a supportive group has been very beneficial. The investment in Video Marketing 101, is on the right hand side of the page. You can choose whether to invest in Video Marketing 101, with a single investment of $797.00 US or a monthly payment of $297.00 US, for 3 consecutive months. Once you have completed your payment, you will receive an email with the course outline and dates and times and video links. If you would like to discuss how your business will benefit from using video, you are welcome to book a Complimentary Call here. If for any reason, you don’t receive an email confirmation of either your investment for Video Marketing 101 or your Complimentary Call, please send an email to info@WisdomToWealthMastery.com and we send you the information. I am looking forward to getting to know you, your business and your dreams and to showing you how to benefit from the power of video. Today, Video is a "Must Have", so don't leave home without it! Welcome to Wisdom To Wealth Mastery's Video Marketing 101 and congratulations for taking the plunge into the world of video, so you can extend your reach, influence, visibility, impact and income and have people come to know, like and trust you. If you are in business today, don't leave home without video!